The Very Best Trading Software and support for Share Traders and investors. Oracle Traders are proud to be the preferred authorised distributor of MetaStock in Australia. MetaStock is the world's leading technical analysis charting package and continues to be the benchmark for all other stock charting software programs; it is sold in over 97 countries worldwide, and is recommended by serious traders everywhere. OracleSCAN Powerful Stock Market Search Engine • Find undervalued stocks in seconds • Sort by broker consensus for buy and sell recommendations • Combine fundamental and technical analysis • Super easy to use; No formula language. • Import and export data directly to Metastock. The Metastock Traders Kits are our most popular packages for new traders. We have three Traders kit packages available to suit everyone's needs, they are all heavily discounted and include everything you need to get started trading with Metastock. please click here for more details. The trading software and support for share traders and investors. We are the authorised distributor of MetaStock in Australia. Shop around the clock wherever you are. Oracle Traders new trading outpost is now open for business. Oracle Traders are an Australian based company helping retail investors achieve trading success. Oracle Traders are an Australian based company dedicated to helping retail investors achieve trading success. Our customer service staff will help you with all your enquiries to ensure you get the correct product to suit your needs. We have the highest quality market data and support to help you get the most out of your share trading software. We believe in good old fashioned service, integrity and value for money and offer free trials on most of the charting software and data products we supply. Our most popular packages are the MetaStock Traders Kits, they represent excellent value, and include everything you need to get started trading, including Metastock, market data, education and local support: We have 3 choices of the Metastock Traders kit, one to suit everyone. MetaStock is the world’s leading technical analysis charting package and continues to be the benchmark for all other charting software programs; it is sold in over 97 countries worldwide, and is recommended by serious traders and investors everywhere. Our technical staff are available to assist you with set-up, installation, and can answer any questions you might have. We also have a free E-Book containing practical information about Charting, Metastock, Fundamental analysis, Money Management available here. We know that quality software, Education and Market data services along with friendly local technical support are important to you, so feel free to contact us on 1300 299 603 and take the next step. (2) Metastock V16DC Traders Kit Local Premium ASX Equities+ Indices + World Indices data. What is Thomson Reuters MetaStock? Thomson Reuters MetaStock is a software program that is designed to help you make better decisions about when to buy and sell in the Equities, Forex, Futures, and Commodities markets. Thomson Reuters Metastock RT is our real-time product that is powered by Thomson Reuters Eikon for Retail Traders – without it, your Metastock RT product will not have data. Thomson Reuters MetaStock is our end of day product that is powered by Thomson Reuters DataLink data – without it, your MetaStock End of Day product will not have data. Metastock V15 now gives users the option of choosing your own data vendor or using Metastock with Reuters Datalink. We continue our partnership with Australia’s best ASX and USA Equities, World Futures & Forex local data provider for use in Metastock V15. We offer this data at great rates and provide full support, for more information please email info@metastockaustralia.com.au or call us on 03 9459 2317. What is the difference between End-of-Day and Real-Time? Real-time traders use intra-day data (prices that are constantly updating throughout the day) to make decisions about when to buy and sell during the trading day, this also allows you to look at different time frames (examples, 1 Min, 8 Min, 30 Min etc.). End-of-day traders access their data (Date, Open, High, Low, Close and Volume for the day after the markets have closed. 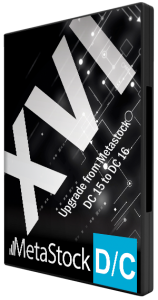 Some markets like the ASX have what is called Intra-day snapshot data available which can be used with Metastock DC 14,15 and older Local data versions of Metastock from 11 lower. Snap shot data works like this with our local data. The snap shot is a 20 minute delayed snapshot of the data each hour during the day sent through from the exchange. So the first one is available at 11.20am each day. If you close Metastock and do an update at 11.20am, you will get the data (open, high, low, close and volume @ 11.00am). The exchange sends the next snapshot at 12.20 for the 12.00 noon data, open stays the same, high, low, close and volume are updated on that one bar to reflect the 12.00 noon update. If you do an update at say 12.45, you still get the 12.00 update,(only one snapshot per hour 20 mins delayed) the next change is at 1.20 for the 1.00 etc during the day. If using Datalink the ASX portion of the market with update automatically when you refresh your open charts or display the intraday data if you open a chart after 11.20 am AEST. What is Local Data and how does it compare to Thomson Reuters data. Local data is available to be used again with Metastock version 15, it’s a return to what the older versions of Metastock from 11 and lower did. We provide the very best quality local Metastock data for the following markets ASX and USA Equities/Indices (NYSE, NASDAQ, AMEX NYSE ARCA), World Futures and FOREX markets. All historical data for the plan you sign up for is included free with the annual data subscription. Local data is downloaded to your local computer via our Oracle updater program, once the data has been downloaded, your software program does not need to be connected to the internet. All you charts and explorations are displayed and run from data stored on your own computer, this is a far more efficient and reliable solution for the vast majority of Australians. Thomson Reuters data is stored on servers in the USA, when you subscribe to Thomson Reuters data, you need to be connected to the internet, the data does not get stored on your local computer.When you wish to display a chart, the data is sourced from the servers in the USA and displayed on your screen, the good news is the data does not need to be downloaded daily like local data does, however running Metastock online has its limitations, reliability and speed are the main issues. In my experience, using our premium local data in Metastock 15 is better all round option. Can I try Metastock before I buy? Yes, Metastock is available as a monthly lease with the first 30 days free or you can buy 1 month and get the next 2 months free. Why should I buy Metastock and data from Oracle Traders. Oracle Traders provide quality local support to ensure you get help when you need it. We have been using and supporting Metastock for over 20 years and our aim is to ensure you get great value from your purchase. We only recommend the best educators and data products all at very competitive prices, we are your one stop shop for all things Metastock and data. "I chose Oracle Traders because you guys gave me a lot of your time and help over the phone while I was looking for a program to help me with my share trading. I am still learning the software, but I'm getting better and having a great time. Thanks for your support, it's been fantastic." "Thanks for all your help yesterday. I did warn you that we were both hopeless with computers. I am glad I choose oracle traders and will definitely be recommending you to my friends." "A good friend of mine put me on to you. I was a little sceptical at first because I have always had a mistrust of companies in the finance industry, but I am happy to give you the thumbs up. You've made a complex subject easy."